Just an average host or something more? Here's what we found out during last 37 months. We’ve been a paying customer for Web Hosting Hub for the last 40+ months. During that time, we’ve monitored their performance – avg. load time and uptime. Web Hosting Hub aims to provide affordable shared hosting to small businesses. Founded in 2010, they’re owned by the conglomerate InMotion Hosting. Web Hosting Hub is headquartered in Virginia Beach, VA, and they have two U.S. data centers – one on each coast. Their 200+ U.S. based team services over 40,000 customers, providing a simple platform to help you start, run and grow a new website. WHH also use solid-state drives on all plans, which (as claimed) can deliver up to 20x faster than more traditional mechanical hard drives used the by competition. 20x is a bold promise. Do they back it up? To find out, we set up a new basic WordPress website on the Web Hosting Hub ‘Personal Web Hosting Plan’ in June of 2015. In-depth performance stats including uptime and speed can be seen here (click ‘History’ to dig deeper). In order to provide an unbiased review, we also cross-referenced a few others sources to do a complete ‘background check’ of what other users think. Web Hosting Hub boasts incredibly fast speeds due to their state of the art technology at an affordable cost. Does the data live up to the hype? Let’s take a look at where they perform admirably. Web Hosting Hub prides themselves on speed, referencing (many times) the fact that their solid-state hard drives can be up to 20x faster. While our experience didn’t show 20x faster, their page loading times were about 21.7% faster than the competition (716ms vs. 890ms). Not quite the fastest, but still very good considering that even a one-second delay can cause a 7% decrease in site conversions. While this is a relatively good result from WHH, there are still hosts who are much faster. Good uptime is critical, and Web Hosting Hub delivered. Fast page loads are equally important because site visitors will leave in droves if your site takes longer than a few seconds to load. But customer support can be a deal killer if issues aren’t addressed or fixed quickly. Web Hosting Hub provided pretty good customer support, connecting with us in under three minutes (plus an additional five to verify our account). There was a bit of downtime and lag between responses, so it wasn’t as quick or concise as many others we’ve experienced. In overall – a positive experience. Our background checks confirmed as much, revealing that the majority of other customers are also satisfied with Web Hosting Hub’s customer support. Web Hosting Hub features a simplified, quick signup process that might be the best we’ve seen after reviewing almost 30 other web hosts. It’s so easy (“How easy is it?”), that even the LEAST technical person you know could figure it out. On their signup page, you can select to install WordPress as your website/blog content management system or Prestashop for eCommerce. After a simple click, they take care of all the heavy lifting and will configure everything for you. Do you have a website hosted somewhere else? No problem! Web Hosting Hub will transfer up to three websites and databases for you (assuming they don’t exceed 5 gigs). Another added bonus includes their ‘zero downtime’ promise during this process. Starting up a new site? They’ll throw in a free domain name to sweeten the deal. Warning: You tech geeks are about to have a nerdgasm! Web Hosting Hub likes to boast that every site they host takes advantage of new solid state hard drives. These ‘SSD drives’, according to the experts at PCMag, can deliver 20 times faster results than normal (mechanical) hard drives used by some of the competition. You can always tell which companies stand behind their service by looking at their refund policies. Web Hosting Hub is a big believer, offering a full 90-day money back guarantee (one of the few offers with an extended term). That means if you’re considering giving them a chance, you have an almost risk-free chance to ‘test drive’ their services for a full three months. That’s great news if you’re worried about committing to a web host only to find out later that you dislike their services and features. According to Web Hosting Hub’s Terms of Service, there are a few nonrefundable fees that may apply, though. Fees paid by a subscriber, like purchasing SSL certificates, domain privacy, or domain names are nonrefundable. If a subscriber registers a domain name through Web Hosting Hub as part of a “Free Domain Name” promotion, they will have to pay $11.99 per year for the domain, plus a $5.00 administrative fee. That means that they will deduct a total of $16.99 from your total refund amount, which is pretty standard when compared to most competitors. However, you’ll retain complete ownership of your domain name(s), and you can transfer them to an alternative host after canceling your subscription with Web Hosting Hub. While I wasn’t able to find any certifications for Web Hosting Hub from the EPA that prove that it’s a green web host, they do have several eco-friendly policies. Since 2010, the company has claimed to make efforts to reduce waste, recycle as often as possible, and use fewer paper products. Web Hosting Hub has an energy efficient data center, and they believe that reducing energy usage is better than simply offsetting it. The company opened up the first (ever!) green data center in Los Angeles, CA by using advanced Outside Air Cooling technology. They’ve cut their cooling costs by 70% by switching to this cooling method, and they also claim to have reduced their carbon output by over 2,000 tons per year. According to Building Energy Resilience, just one ton of CO2 would fill up a 1,250 square foot, one-story ranch house (with an average height of 13 feet) full of carbon dioxide, so that’s a huge reduction! Outside Air Cooling vents hot air out of the building to bring cooler air in, only cooking it through the CRAC units when it’s necessary due to high temperatures or humidity. Traditional data centers run Computer Room Air Conditioners, also known as CRACs, 24/7. This method allows for hot air to be cooled and then recirculated, but it burns more energy than needed. If you’re concerned about reducing your carbon footprint or you’re looking to work with brands who care about the environment, consider Web Hosting Hub. They may not be as green as other sites, like Green Geeks, but they’re still making innovative waves when it comes to being energy efficient. Our eight-month testing process revealed that Web Hosting Hub has an average uptime of around 99.95%, .01 faster than the industry average (99.94%). Although they’ve struggled since almost the beginning to deliver good uptime consistently. Some months are great, while others struggling for stability. Kinda a mixed bag to be honest. Web Hosting Hub provides a decent list of positives. Speed was good. And support was decent too. Those are a few of the primary ways to evaluate a host, and Web Hosting Hub delivered the goods. Unfortunately, there are a few potential drawbacks as well. Web Hosting Hub likes to keep things simple, offering ONLY shared hosting options. That provides a few benefits, like their fast signup process. If everything goes well and your site takes off, that might pose a few problems. Larger websites (and more savvy users) like to use dedicated hosting options for larger sites that require more resources to run. And if you hit this tipping point, you might be forced to start the hosting-reviewal process over again by looking into more premium options elsewhere. Kind of a hassle if you know this might be an option in the not-too-distant future. Sure, that low $4.99 monthly pricing seems like a great deal. BUT you gotta sign up for a full three years to get it. Wanna just start with month-to-month? You can’t. Twelve months is the lowest they’ll go, and that price jumps up to $6.99 monthly (paid in advance). Not such a great deal after all. 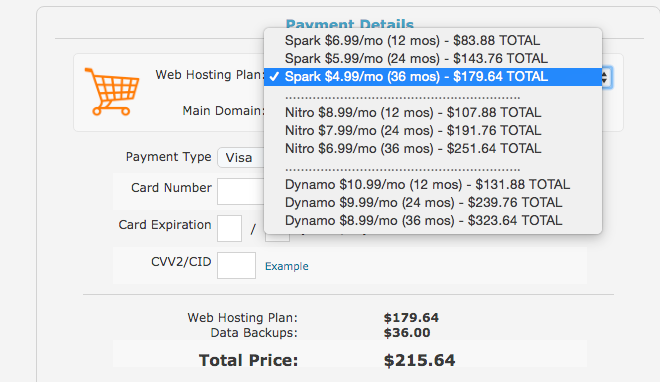 Unfortunately, this pricing trick is pretty pervasive in the hosting industry, as many try to pull the same stunt. Buyer beware, I guess. Daily backups are incredibly helpful for a variety of reasons. For example, sometimes, plugins don’t play well together. You upload a new one and hit Activate immediately without checking to see what versions of WordPress (or your theme) it’s been tested for. All of a sudden… nothing. Site go bye-bye. At least you can easily recover from this mistake. God forbid hackers to exploit security breaches and inject malicious code. Good luck cleaning that out! Backups can help you in each case, allowing you to basically hit the rewind button to simply roll back to a previous version. BUT they’re only good if you (1) remember to do them, (2) do them consistently, and (3) keep them ‘offsite’ so they’re not corrupted either. Web Hosting Hub offers to provide daily backups, and will even automate the process, but it’ll cost you an extra dollar each month. Most other web hosts will throw in security features for free, as part of their core offer. But again – Web Hosting Hub nickel-and-dimes you for anti-virus and anti-spam protect, and more. The prices themselves aren’t that terrible. It’s the principle of it that’s frustrating. Web Hosting Hub (similarly to parent company InMotion Hosting) might require extra details (like even a live phone call) to completely verify your account. In theory, this is positive because it’s for security. However, it can still be frustrating if you’re trying to get things up-and-running and you’re located overseas. Spark plan: This plan costs $4.99 per month. It supports 2 websites, 10 MySQL databases, and 25 sub-domains. Dynamo plan: This plan costs $8.99 per month. It supports unlimited websites, unlimited sub-domains, and unlimited MySQL databases. All their hosting plans come with a free domain name, a fancy icon, are powered by SSD and come with SSH access. Ease of Signup: Very easy, one-page-sign-up process. One of the best. Hidden Fees and Clauses: There is a limit of 75,000 files and 10,000 messages (or 2GB in size) for their users. Accounts that exceed 10GB or 75,000 files are automatically excluded from their backup system. It can cost up to $50 to have your backup restored. Account Activation: Quick activation. Beware of the account verification, especially if you’re outside the US. Installation of Apps and CMSs (WordPress, Joomla, etc. ): Quick and easy install of popular apps and CMSs via Softaculous. Do We Recommend Web Hosting Hub? Unfortunately, we can’t recommend Web Hosting Hub. Their page load times and customer support is pretty good. But their uptime is all over the place, and pricing isn’t as good as advertised. Your account verification might get delayed 24 hours – if you based outside US. And in overall, their performance is just a bit too average. You’d be better signing up with their sister brand: InMotion hosting, or choosing something from our top web hosting reviews. Have you used Web Hosting Hub? If so, please leave an honest and transparent WebHostingHub review below. We welcome all positive and negatives experiences. I’ll be honest they started out pretty decent till their team literally messed up and deleted my entire website! So my business was down for over 24 hours for a mistake they kinda admitted to making, they make it nearly impossible to move domains off of their servers and charge cards for cancelled services... overall it’s a trainwreck and borderline scammy! I have been with Web Hosting Hub for about 4 years now. I have three websites with them. The speed could be better but it's ok. I have the cheap basic package and if I wasn't using Google Analytics tags, it would be faster... But it's ok. I do SEO Services so I know certain things to not have my speed that bad. My speed is below 5 seconds of loading so I am ok with it. I have learned so from Web Hosting Hub though... I learned enough to actually start an SEO Company and of course through experience and trial and error. Their customer service is second to none. I definitely appreciate what they have done for me over the years and I definitely recommend them. I bought Web Hosting Hub cheapest shared plan back in 2013 when I launched my first WordPress blog. The sign up process and installing WordPress was pretty painless, but since I paid via PayPal and lived outside of US at that time – they required me to send in my ID card for proof of payment. I felt it was just too much, but I sent it in anyways. After few hours, my account was fully verified. Fast forward 3 years, I haven’t seen any problems or errors. Once there was a downtime of around ~1hour since they did some sort of datacenter migrations (not sure what it is), but overall they’re pretty good = 7/10. How does ‘WebHostingHub” rank vs. competitors? Uptime and speed data provided by HostingFacts (see raw data here).